Have you ever thought of growing your very own vegetable? 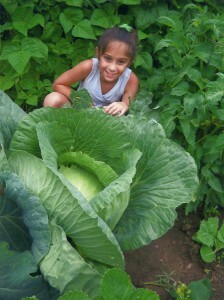 Through the 3rd Grade Cabbage Program, you can grow a HUGE cabbage all on your own! If your class isn’t already involved, ask your 3rd Grade teacher to enroll your class in the Bonnie Plants 3rd Grade Cabbage Program. Your teacher must be the one to register your class. You’ll get your very own cabbage to grow. This special type of cabbage is called the O.S. Cross; the “O.S.” stands for oversized because these cabbages can grow to be gigantic—even bigger than a basketball! In 8 to 10 weeks after planting, you should have a healthy cabbage ready to pick. Growing a cabbage also gives you a chance to win a $1,000 scholarship from Bonnie Plants, plus statewide recognition. We award a scholarship to a winner from each state. You must first be your classroom winner, and then your teacher must submit your cabbage in order for you to have a chance to win for your state.